Acute kidney injury (AKI), the precursor to Acute renal failure (ARF) is the rapid loss of the kidney’s ability to remove waste and help balance fluids and electrolytes in your body. This sudden loss of kidney function, which is recoverable, can be the result of illness, physical trauma, or nephrotoxic drugs. In contrast, chronic kidney disease (CKD) is a long and usually slow process where the kidneys lose their ability to function, and if not resolved, progresses to end-stage renal disease (ESRD). During ESRD, the kidneys are no longer able to remove sufficient waste and excess fluid from the body, requiring the need for dialysis or a kidney transplant. Numerous studies have identified a number of proteins and metabolites present in blood or urine with varied utility as diagnostic or prognostic markers of these various stages of kidney injury, disease progression, or nephrotoxicity. 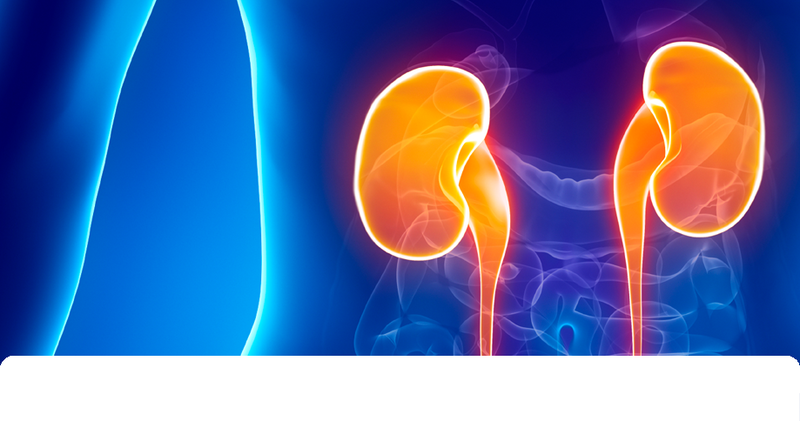 Enzo provides a variety of tools to detect the early stages of acute kidney injury or renal failure, including sensitive ELISA kits for detection of KIM-1, NGAL (lipocalin-2), and cystatin C. These rapid, high sensitivity kits are validated for a variety of species and samples types. Ultra-sensitive ELISA kit, enabling reduced input sample and matrix interference, for the quantification of KIM-1, an early biomarker for acute kidney injury or disease. 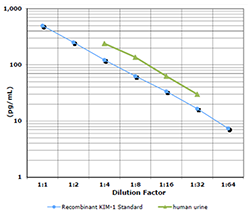 Parallelism analysis using the <a href="http://www.enzolifesciences.com/ADI-900-226/kim-1-human-elisa-kit/">KIM-1 (human) ELISA kit</a> (Prod. no. ADI-900-226) indicates antigen binding characteristics are similar to native KIM-1 in urine samples with no matrix interference at the dilutions tested. 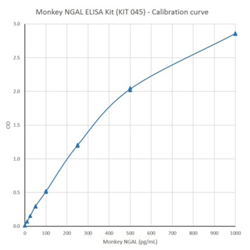 Calibration curve for NGAL (monkey) ELISA kit (BPD-KIT-045). Human Cystatin C is a lysosomal cysteine proteinase inhibitor produced at a constant rate by all nucleated body cells and occurs in all body fluids abundantly. Serum cystatin C concentration correlates negatively with glomerular filtration rate (GFR) as well as or better than creatinine, and as such is a sensitive marker of changes in GFR. Enzo offers a range of ELISA kits for detection of Human, Mouse, and Rat Cystatin C, along with high-purity human Cystatin C protein. Creatinine (2-amino-1-methyl-5H-imadazol-4-one) is a metabolite of phosphocreatine (p-creatine), a molecule used as a store for high-energy phosphate that can be utilized by tissues for the production of ATP. 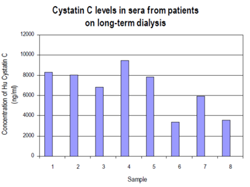 Creatinine forms spontaneously from p-creatine, and under normal conditions, its formation occurs at a relatively constant rate, making it a useful marker for normalizing levels of other molecules found in urine such as urinary prostacyclin. Altered creatinine levels may be associated with conditions that result in decreased renal blood flow, such as diabetes and cardiovascular disease. Matrix metalloproteinase-9 (MMP-9) is a member of the MMP family of extracellular proteases. These enzymes play a role in many normal and disease states by virtue of their broad substrate specificities. Targets of MMP-9 include native and denatured collagens, fibronectin, elastin, laminin, pro-TNF-α, and interleukins and their receptors. The MMP-9 Fluorometric Drug Discovery Kit, RED is a complete assay system designed to screen MMP-9 inhibitors using a quenched fluorogenic substrate OmniMMP™ RED. No Risk! Test new applications and species using our Worry Free Antibody Trial Program! Hsp70 nucleotide exchange and substrate binding coordinates the folding of newly synthesized proteins, the re-folding of misfolded or denatured proteins, coordinates trafficking of proteins across cellular membranes, inhibits protein aggregation, and targets the degradation of proteins via the proteasomal pathway. Various renal insults result in induction of HSP expression within the kidney, and some HSP induced in that manner are postulated to have renoprotective effects either via chaperoning actions or antioxidative properties. Neutrophil gelatinase-associated lipocalin (NGAL) belongs to the lipocalin family of proteins which bind and transport small lipophilic molecules. The expression and release of NGAL from renal tubules is dramatically increased by ischemic or nephrotoxic injury. Kidney Injury Molecule-1 (KIM-1) is a type 1 transmembrane protein, with an immunoglobulin and mucin domain, whose expression is markedly up-regulated in the proximal tubule in the post-ischemic rat kidney. KIM-1 is a potential biomarker for renal injury or renal inflammation. It is a traditional blood and urine marker for the diagnosis of various renal diseases. The SCREEN-WELL® Nephrotoxicity Library is a focused collection of compounds with defined and diverse nephrotoxicity, including analgesic nephropathy, interstitial nephritis, glomerularopathy, proximal and distal tubulopathy, acute renal failure, chronic kidney disease, and more. A variety of structurally and mechanistically different compound classes are included, as well as nontoxic controls. The library enables better understanding of mechanisms of toxicity and is an essential tool for predictive toxicology screening and assay development.